Above: Contents of one of the cormorant stomach samples prior to analysis – not all were full to the brim like this one but many were. Above: Close-up of a stomach sample – A tangled mass of fish bone. Above: Peamouth chub (Mylocheilus caurinus), L to R, pharyngeal bone, cervical vertebrae and otoliths from one sample. Scale is a Canadian dime. Above: Remains of Surf smelt (Hypomesus pretiosus) from the sample, clockwise from left, hyomandibular, basioccipital, vertebrae, otoliths. Scale is a Canadian dime. Above: An array of Pacific sardine (Sardinops sagax) bones from the cormorant stomach. Scale is a Canadian dime. 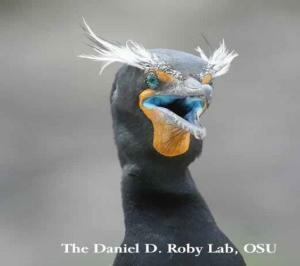 Here are some photos from Susan Crockford’s analysis of stomach content samples recovered from double-crested cormorants (Phalacrocorax auritus) in the Columbia River estuary for research on cormorant diet & predation (conducted by Bird Research Northwest, Daniel D. Roby, PI and Ken Collis, Co-PI, a partnership between Oregon State University, Real Time Research and the USGS-Oregon Cooperative Fish and Wildlife Research Unit, http://birdresearchnw.org). 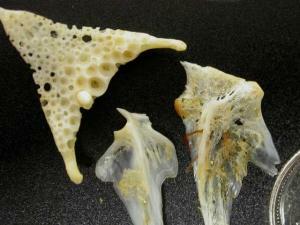 Above: Some samples contained virtually nothing except three-spined stickleback (Gasterosteus aculeatus) bones. Paired pelvic bones, shown above left, were the most common element recovered. These were counted (and the number divided by two) to estimate the minimum number of individuals consumed. Scale is a Canadian dime. 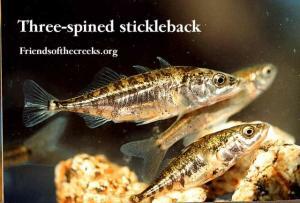 Above: A three-spined stickleback (Gasterosteus aculeatus) in the flesh. Above: Remains of a red-tailed perch (Amphistichus rhodoterus) in one sample, L to R, inferior pharyngeal plate, articular, hyomandibular. Scale is a Canadian dime. 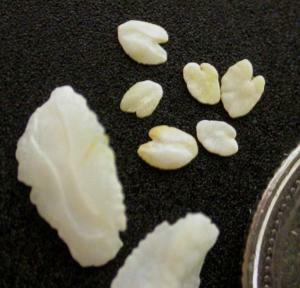 Above: Otoliths of red-tailed perch (Amphistichus rhodoterus) from the same sample as the perch bones. Perch are ovoviviparous (they live-bear their young) so it is likely the larger otoliths came from a pregnant female and the smaller ones from her unborn young. Scale is a Canadian dime. Above: Northern anchovy (Engraulis mordax) remains were often recovered, pterotics (paired cranial bones) were usually the most numerous element and these were picked out and counted to provide an estimate of number of fish consumed. Above: Sculpin bones tentatively identified as Bonehead sculpin (Artedius notospilotus), L to R, preoperculum, hyomandibular, vertebra, articular. Scale is a Canadian dime. 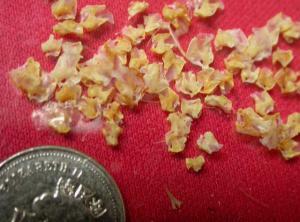 Above: Pacific staghorn sculpin (Leptocottus armatus) bones, L to R, preoperculum, hyomandibular, preoperculum, otoliths. Scale is a Canadian dime. Above: L to R, Pacific sardine (Sardinops sagax) pterotics - a paired cranial bone - and the same from Northern anchovy (Engraulis mordax) from one cormorant stomach. Above: Pacific sardine (Sardinops sagax) bones from one sample. L to R, from bottom: dentary, pterotics, hyomandibular. Scale is a Canadian dime. Above: Pacific herring (Clupea pallasi) remains from one sample. Pterotics (top), dentary (bottom). Scale is a Canadian dime. Above: Remains of American shad (Alosa sapidissima), an Atlantic species related to herring, introduced into California in the 1870’s), were found in several samples. L to R, from bottom: dentary, pterotic, hyomandibular. 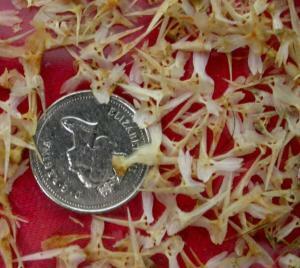 Most were quite small, like these ones, although some were much larger, like the ones below. Scale is a Canadian dime. Above: Remains of a large American shad (Alosa sapidissima) were found in one sample. L to R, from botttom: articular, ceratohyal, dentary. Scale is a Canadian dime.